It's time for Challenge #295 at Little Red Wagon. This week's challenge is called, "Cute as a Button". This will be my very last challenge with Little Red Wagon. I have totally loved being a part of this wonderful team. I have a fun July planned already....and who knows where I'll go next!! Every product on my card is from MFT Stamps. 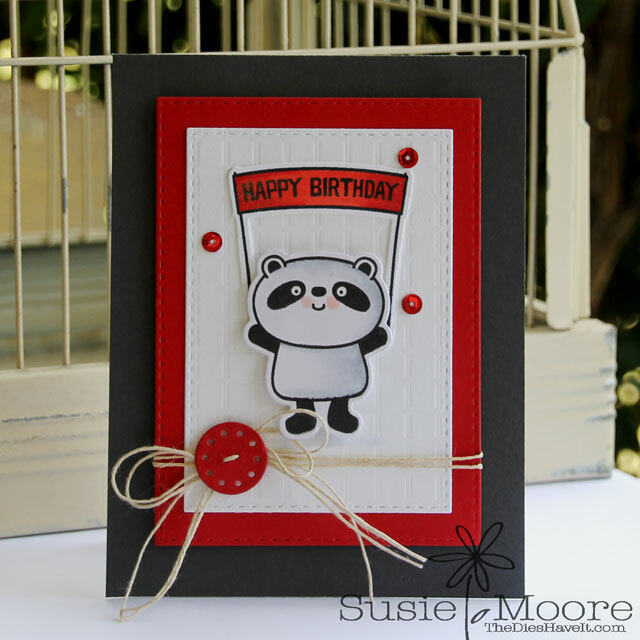 I love that panda and the vintage die cut button is just the perfect finishing touch! Don't forget to check out what all the designers have created this week. Once you have been totally inspired, be sure to create your project and link it up on the Little Red Wagon blog. I hope you'll play along with us this week! See you tomorrow. Have a wonderful day! Aw, this is so cute! I love the colours too. It was great to work with you. Take care. Adorable. We will miss seeing your creations on the Little Red Wagon team. Best of luck in all your future endeavors. Hugs!! Another amazing creation. Great having you as part of the LRW team.